Will Testosterone Make You Stronger? The reason men have more muscle mass than women has to do with the hormone testosterone. Their testosterone levels are much higher than those of females, who have a higher estrogen to testosterone ratio than males. That is why men are inherently stronger than women. It is also the reason why men lose muscle size quicker as they age. In this report, we look at how testosterone affects strength as muscle mass declines along with testosterone levels. Testosterone levels decline for all adults as they age. For men, it is a slow process, often beginning in one’s mid-twenties. Since the reduction is only about one to two percent a year, most males will not notice much of a change until they reach their forties or fifties. There may come a time when gym workouts no longer produce the desired results. With the decrease in testosterone levels, muscle strength and mass begin to decline. Women tend to maintain higher levels of testosterone until menopause when the ovaries cease all hormone production. At that time, testosterone, estrogen, and progesterone levels all plummet. Some testosterone and progesterone still come from the adrenals. The biggest change is that estrogen conversion from testosterone further lowers what little free testosterone women have, often creating a condition of estrogen dominance. Men can get that condition, too, which leads to weight gain and further loss of lean muscle mass, strength, and flexibility. That is also why women notice a significant decrease in muscle and strength following menopause. 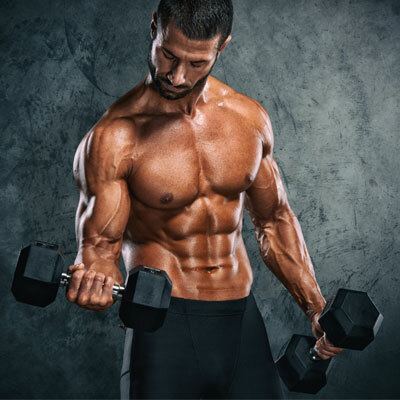 Ensuring an adequate supply of testosterone, whether naturally produced or through testosterone therapy, can help improve muscle mass and strength throughout the latter years of one’s life. Declining testosterone levels in later years leads to loss of lean muscle mass and strength. Strength of the muscle is defined as the muscle’s maximal force-generating capacity. Power is the rate of generating that force. Endurance or muscle fatigability is the ability to make repetitive dynamic contractions or sustain a submaximal contraction before becoming fatigued. To test the testosterone effect on strength, a study looked at 61 healthy men between the ages of 18 and 35 years, of which 54 completed the study. Although the subjects were not actively involved at the time in strength training, they did have previous weight-lifting experience. Requirements included body weight of no more than 20% above ideal for their height, no athletic competition during the 12 months before the study, and no use of anabolic steroids during that same time. Testosterone administration of either 25 mg, 50 mg, 125 mg, 300 mg, or 600 mg per week of intramuscular testosterone enanthate was used in conjunction with monthly injections of a long-acting gonadotropin-releasing hormone agonist. Resistance training and intense, prolonged endurance training were not allowed. A standardized diet was required. The testing of how testosterone affects strength looked at maximal voluntary leg press strength by the amount of weight a subject could lift only one time (one repetition maximum – 1-RM) on a seated leg press machine. Multiple repetitions and increased loads with 2-minute rest periods were used to determine the 1-RM for each person. Those men receiving 300 and 600 mg experienced significant gains in leg press strength, with 50 mg following behind. The men who received 25 or 125 mg of testosterone did not see a significant increase from baseline. The testing of power utilized a foot pedal of a leg power instrument designed for the study having the right knee flexed to 90 degrees. Those men who received 600 mg of testosterone experienced the greatest increase in power, with 300 mg following next. The increases were considerably lower for men in the other three groups. For the muscle endurance, a Keiser leg press a measured the total repetitions to failure of completing the repetition. There was very little difference between the groups in this area, showing that changes in fatigability were not significant with testosterone therapy. In the previously mentioned study on testosterone levels and strength, researchers reduced natural testosterone with a GnRH agonist before supplying supplemental testosterone. The purpose was to allow for a controlled look at how higher testosterone levels would impact muscle strength. Overall, the study shows that higher testosterone levels do correlate to increased muscular strength. Numerous studies of older men back up those claims. In fact, some research even points to increases in lean muscle mass and strength without exercise resulting from testosterone therapy. In one analysis of how testosterone affects strength in numerous studies, testosterone replacement therapy was not shown to increase muscle study overall, even though some singular studies showed this to be true. However, TRT was found to increase the physical function in the participants. Part of the problem in current research is the lack of standardized testing protocols. Although not necessarily conclusive, much research does point to an increase in strength from testosterone. Under no circumstances do we recommend using testosterone for the sole purpose of increasing strength or lean muscle mass. Testosterone is a hormone that has a natural range level in the body. Raising that level higher than ideal can result in potentially dangerous side effects. When we look at how testosterone affects strength, we also find that too much testosterone can have detrimental impacts on the body. Balanced hormone levels and specially targeted exercises can do more for increasing strength than unnecessary hormone therapy. If, however, you have symptoms of low testosterone along with clinically diagnosed deficient levels, then TRT may be the best option. Targeted and customized testosterone therapy along with exercise can significantly increase testosterone levels. Strength and muscle mass will likely improve when following a doctor-prescribed course of treatment. Contact our hormone clinic for a free consultation to find out if testosterone therapy can help you improve strength and lean muscle mass.